Atelier Munsteiner, Stiphausen, Germany. The 4th generation of stone cutters most well known over the world, presented their 9th in-house-exhibition. 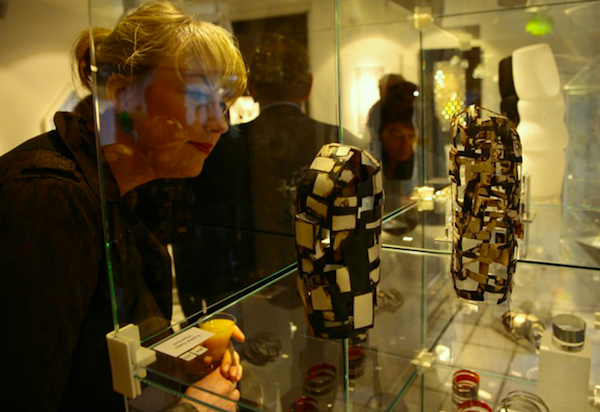 Every second year the Atelier features new works of Munsteiner’s as for experiencing a full spectrum of jewellery, painting, sculpture and glass. Most recently edition of this exhibition, featured the works of Estela Saez, in her last series of precious stone and silver “Nowhere in between” and “Meet me there”. A a catalog accompanied the exhibition with text on Estela’s work written by Historian and German language MA, Julia Wild. […]In some of her pieces the silver setting criss-crosses, forming connections. The stone is a part of the structure rather than alone in the centre. The pieces are sculptural, have a life of their own which opens up their surroundings. The light and movement continually open up new spaces, which, created by a nomad, are anchored in the here and now, telling stories in this very place and inviting you to travel along with them for a while.